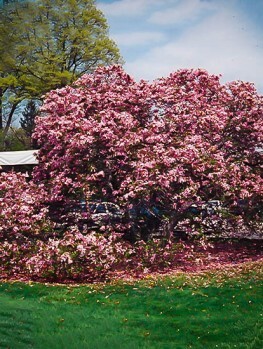 The Blush Fairy Magnolia will grow in full sun or partial shade, in all the warmer parts of the country. It will grow in most garden soils, as long as the soil is well-drained and open, and it has no pests or diseases. Grow this plant as a screen, as a hedge, as a small tree, or as a specimen bush. However you introduce this remarkable new plant to your garden, it will dazzle you with its beauty, astound your friends and neighbours and make a real impact everywhere it is planted. 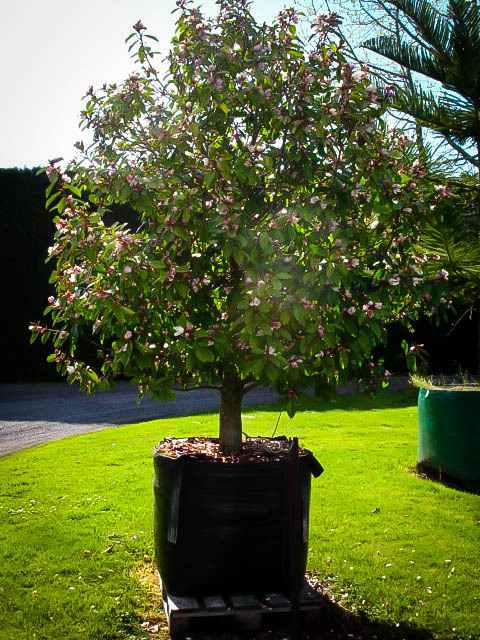 The beautiful Fairy Blush Magnolia is something completely new and different, not just a variation on an existing plant. 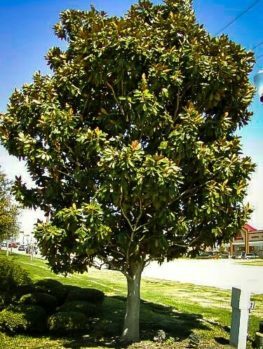 It is the result of 15 years of specialized breeding to create a whole new class of Magnolias, with evergreen foliage like the Southern Magnolia, just as tough, but more delicate in appearance. Its flowers are more like those on the deciduous Magnolias grown by northern gardeners. This exciting new plant has large flowers almost 3 inches across, which don’t just grow at the tips of the branches, but crowd all the way down them at every pair of leaves. The flowers begin as attractive beige-brown buds, covered with dense, soft hairs, and then open in spring to reveal softly-colored lilac-pink flowers that gradually fade to white. This spectacular profusion of bloom is accompanied with a light, delicious fragrance that wafts from the blossoms all across your garden. This is something new among plants, that has also been well-tested and proven tough and reliable. It will bring a unique effect to your garden unlike anything you have ever seen before – this plant really has to be seen to be believed. 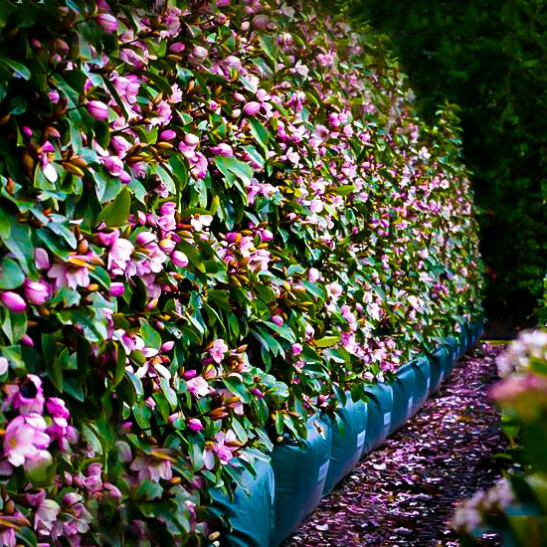 The Fairy Blush Magnolia is a beautiful evergreen shrub that will grow 9 to 12 feet tall in just 7 years, and 5 to 7 feet wide. 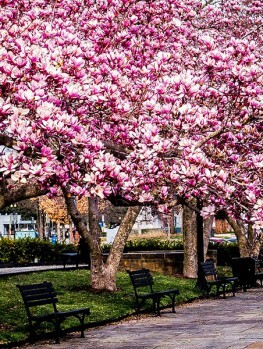 In spring it will be smothered with large, blush-pink, perfumed blossoms – not just at the ends of the branches like other Magnolias, but all along the stems, at every leaf. More blossoms will occur over summer, giving you color, perfume and interests for month after month. This plant has so many uses in the garden it is hard to know where to begin. Plant a row of them as a spectacular flowering screen. Quickly create a marvelous flowering hedge, or group them behind smaller plants to give dynamic depth to you plant arrangements. Use them as center-pieces in the lawn, or among other flowering trees. They can even be grown in large containers for drama and color on your terrace and patio, or around the pool. You can grow your Fairy Blush Magnolia as a bush. 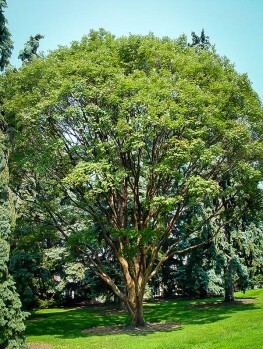 By removing lower branches as it grows, you can also form it into a tree. Plant them 3 feet apart to make a fantastic flowering hedge, or plant them 5 feet apart for a looser, less formal screen. 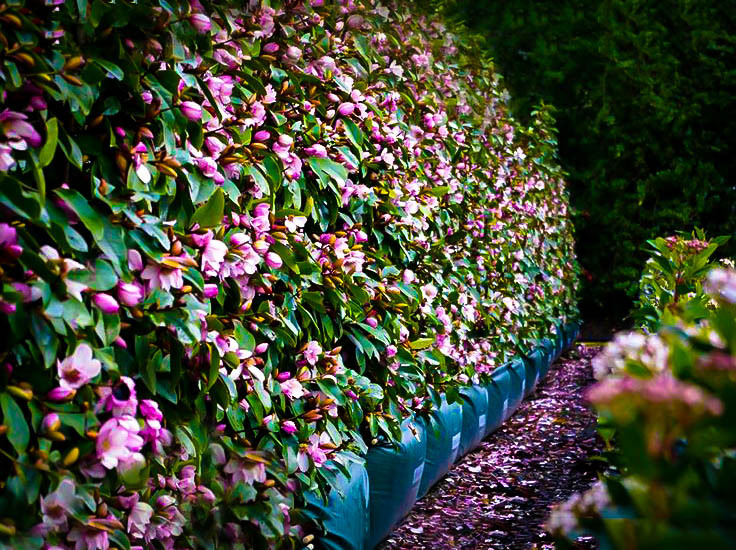 However you use it, the Fairy Blush Magnolia has a place just about anywhere in your garden. These special plants are produced using carefully controlled methods, to make sure that each one has the exact characteristics carefully bred by Mark Jury. 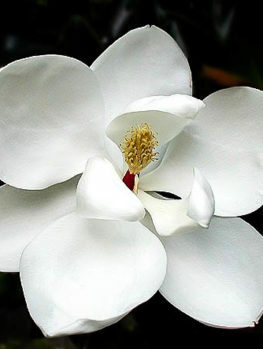 This is a completely different plant from any of the other Magnolia varieties, so cheaper plants will certainly not be this amazing new introduction. The Fairy Blush Magnolia grows throughout the warmer parts of the country, in the warmer parts of zone 7 and throughout zones 8, 9 and 10. It will grow in most kinds of soil, as long as they are well-drained, but will thrive best in richer soils, that have been dug thoroughly to allow the roots to spread easily. There are no significant pests or diseases of this plant, so it is a great low-maintenance plant for easy gardening. 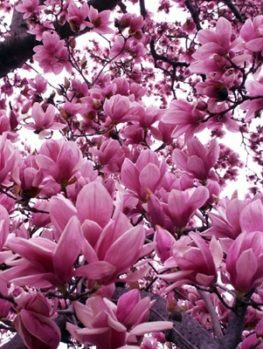 Most gardeners are familiar with Magnolias, either the evergreen Southern Magnolia, or the deciduous variations like the Jane Magnolia. But there is another group, that up until recently were only known and grown by a few knowledgeable and specialized gardeners. For a very long time these plants were not even called ‘Magnolia’, but they were known to botanists as Michelia and thought be just relatives of the true Magnolias. 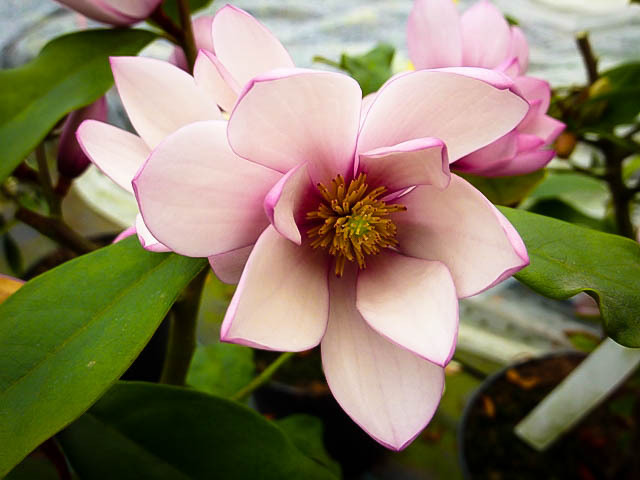 All that has changed – botanists now place these plants among the Magnolias, and plant breeders have taking them and produced wonderful new hybrids. 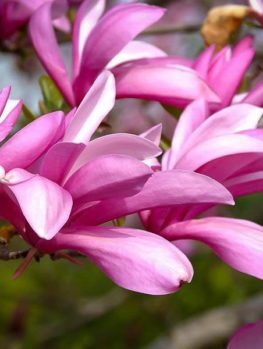 The best of these new forms are the Fairy Magnolias, especially the Fairy Blush Magnolia, with beautiful soft pink flowers, gently perfumed and growing all along the branches. These plants were created by Mark Jury, a plant breeder who lives in New Zealand. He started breeding Michelia around 1996 and he worked hard, with many crosses of the different species, to create these remarkable plants, which are really a completely new kind of Magnolia, never seen before.